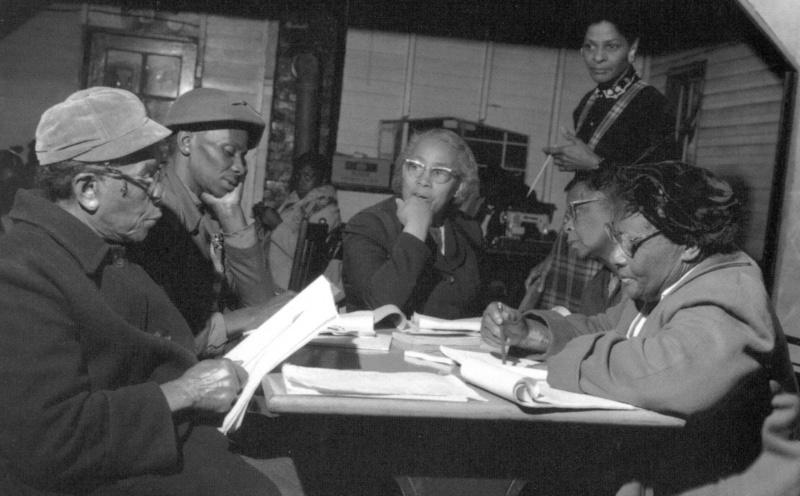 Septima Clark (center). Date/source of photo unknown. Septima Poinsette Clark was born on this day 115 years ago. Without question one of most important figures in the American Civil Rights movement, the story of her role in advancing adult literacy in the U.S.—and in drawing attention to the connections between education, poverty, and political power—should be mandatory reading for anyone interested or involved in adult literacy or education—especially the “education is the civil rights movement of our time” folks who seem to believe that the relationship between civil rights and education began sometime around the year Teach for America was founded. Clark is best known for her role in developing the Citizenship Schools of the 1950s and 60s, where thousands of disenfranchised African Americans across the southern U.S. learned to read and write in order to pass the literacy tests required by southern states to register to vote. But while voting was the focus, the schools also emphasized the role of literacy as an instrument of empowerment more broadly. And unlike today, this was at a time—not that long ago—when teaching reading in such a context was truly dangerous. Classes often had to be taught in back rooms of stores and other hidden places. Teaching people how to read helped countless Black Southerners push for the right to vote, but beyond that, it developed leaders across the country that would help push the civil rights movement long after 1964. Clark wrote two autobiographies during her lifetime: Echo in My Soul and Ready from Within: Septima Clark & the Civil Rights Movement, A First Person Narrative. A collection of her papers is archived here, although none of it seems to be accessible online. But there is a great online “scrapbook” of images, newspaper clippings, and correspondence related to her life at the Lowcountry Digital Library site.